A vibrant splash of colors marks the iconic recall of this prominent festival of India – Holi. Celebrated every year on the Purnima (full moon day) of Phalgun (one of the months according to Hindu calendar falling between February – March), Holi boasts of more than one explanation to rejoice and frolic. Holi has religious significance for Hindus who celebrate the triumph of goodness over evil through this festival. 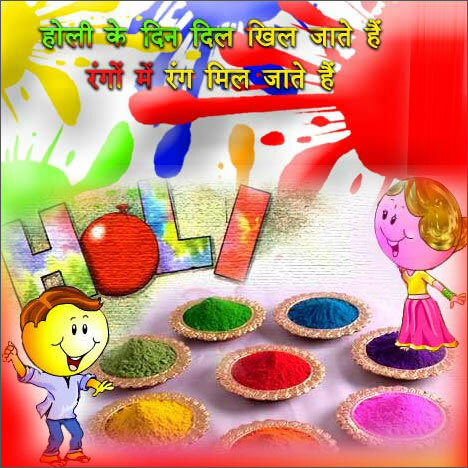 Holi is also celebrated as ‘the spring festival’ or ‘Basant Utsav’, representing the end of chilly winters and the doorstep to the blooming spring season. Dulandi Holi, Rangpanchami, Dol Purnima, Hola Mohalla, Shimgo, Kaman Pandigai, Phagu Purnima and Lathmaar Holi are the various names of this festival that vary from state to state in India, marking the vast diversity of Indian land unified in a strong bond by this festival. Spanning for two days, namely ‘Dulhandi’ or ‘Holika Dahan’ (Holi eve) and Holi or ‘Dhuleti’, the celebrations of Holi start almost a fortnight before its eventual arrival. The local markets swarm with gulal (color powder in red, green, yellow, pink, orange etc. ), Pichkari (water sprinklers), water balloons, variety of other color forms et al, to serve Holi pranks. The formal celebrations of Holi, however, inaugurate with a bonfire on Holi eve, also called ‘Holika Dahan’. The bonfire popularly corresponds to the Hindu epic of devotional excellence exemplified by demon king Hiranyakashyap’s son Prahlad, who was saved from similar fire unhurt by his venerated Lord Narayana, when king’s sister Holika tried to burn him to death. The consecutive morning marks the main Holi celebrations with smearing of gulal and relish of delicacies like Gujiya, Mathri, Malpuas, puranpoli, dahi badas, etc. Children and prankster adults however extend the tradition beyond simple spray of gulal and water to drenching each other with buckets full of water and use all kinds of tough colors, even silver and golden paint in fewer cases. The festival is also viewed by many as a chic opportunity to flirt around unchecked and romance. Thandai or pakoras mixed with Bhang (herbal intoxicant) is another typical feature associated of Holi celebrations, symbolizing the ancient tradition of pure enjoyment and naughtiness attached with the festival. The traditions of celebrating Holi throughout India are as diverse as the colors that constitute the vibrant Holi. While people in metropolitans and cities celebrate spray of colors with feasts, dance and dholak, folks in Barsana and Nandgaon (the places associated with the birth and childhood of Lord Krishna) revive the classic Lathmaar Holi every year. While women in Haryana play the revengeful Dulandi Holi with their devars, people in Maharashtra and Gujrat form human pyramids to break pots full of buttermilk hung high on the streets. On the other hand, south Indians worship Kaamdeva (god of love as per Hindu mythology) to regard his sacrifice to evoke worldly interests in Lord Shiva. The spirit of Holi is the same in all parts of the country, irrespective of the fashion of celebration in each area. The ‘festival of colors’ quite naturally enjoys national importance as the vivacity of colors unfailingly wins over hearts across cultures and religions to participate with equal fervor during this festival. This entry was posted on Sunday, March 4th, 2007 at 4:01 pm	and is filed under Fest Galore. You can follow any responses to this entry through the RSS 2.0 feed. Responses are currently closed, but you can trackback from your own site.